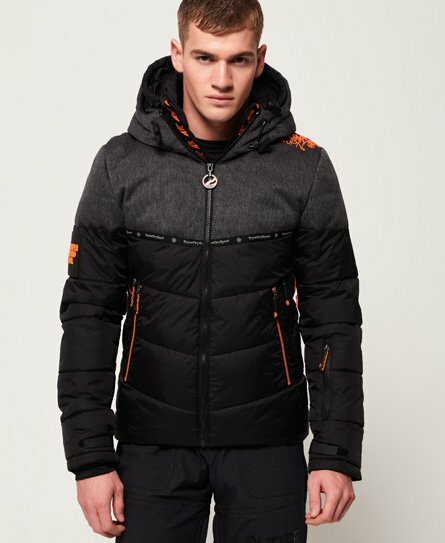 Superdry men's Sartorial snow jacket. Get set for your next adventure on the slopes in the Sartorial snow jacket. Featuring a bungee cord adjustable hood, double layer zip fastening, this jacket is the perfect combination of style and technical performance. The internal snow skirt and wrist gaiters help to keep the snow out and you dry, while pit zip venting allows for easy ventilation. The jacket features multiple pockets for all your ski essentials, including a ski pass holder on the sleeve. The lining of the jacket can also be detached, turning the jacket into a more lightweight option for days off the slopes. The Sartorial snow jacket is completed with a rubber Superdry logo badge on one sleeve and further logo detailing on the shoulder and back.